What is a cold flat roof? A cold flat roof is where the insulation is placed between the joists under the flat roof, so that the roof and the roof timbers are cold. Therefore, the cold roof ventilation needs to be provided to create airflow to the front and rear of the roof to prevent condensation. This is a slightly more expensive flat roof system to build in comparison to a warm flat roof system. Also, it’s not as good thermally as the warm roof option due to more exposure. 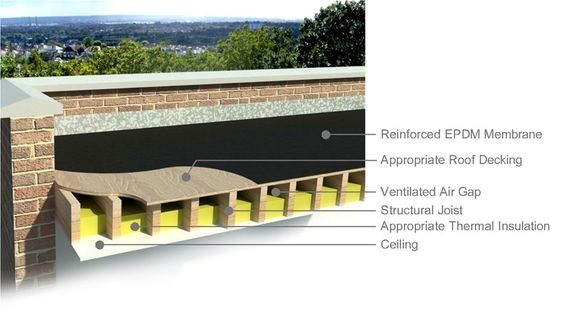 The advantage of the cold flat roof system is that no additional height is added to the structure – however with today’s building regulations, it is necessary to insulate internally underneath the ceiling inside the house. As you can imagine this causes problems such as moving electrical fittings and can cause a big disturbance to the household during the works. A warm roof is a far better option as no ventilation is required and the insulation will be above your flat roof. The warm roof option is where all the roof timbers of the structure are in the warm, thus the name ‘warm flat roof’. Why does a gap have to be provided in between the insulation and the roof deck? Because it is necessary to allow air to flow, so that warm, moist air is allowed to escape rather than coming into contact with the cold deck and condensing. What will happen to my roof if I have condensation? Condensation can lead to rotting decking and/or timbers, damp ceilings and damp insulation, which will then stop working effectively. Why do we check to see if soffit vents have been fitted? External ventilation is essential to minimise the risk of condensation in a cold roof, therefore it would be ideal to have soffit vents to the underside of the fascia board, however many flat roofs have been built without soffits. Can an existing cold flat roof be converted to a warm deck insulated roof? Of course, we can quickly convert any cold deck flat roof to a warm deck flat roof. If the existing roof decking is sound, we can fix the insulation straight on top. For roof decking which may need replacing if not in a satisfactory condition, we would install a suitable material like plywood to provide a strong platform for the warm roof. A warm cure it GRP roof system to kitchen and garage roof, including 600 vapour barrier system to decking. We have been so impressed by the workmanship of Richie and gang. From the first quote delivered to the fast completion of the job. We would highly recommend. Richie presented to me the option of a fibreglass roof over the traditional felt roofing system. I can honestly say that I have never looked back. Tremendous work and fantastic attitude. Fast, efficient and good quality work at a competitive price. Very happy with the jobs previously done for my clients and I look forward to establishing an ongoing relationship. Really happy with the new tiles installed on my balcony. The job was done in a couple of days, and Richard Butler and his team were friendly and hard-working people. Outstanding service. Great communication from start to finish with a very impressive installation. Very happy with the finish too. I would highly recommend Richard Butler and his team. A very well done! Very well done to Richard Butler and his team. Had the job completed in time for Christmas, and I’m very satisfied with the new roof on my extension. I would definitely recommend. Good job all round. Quick and competitive quote with fast installation.